Throughout October I am featuring Memory Monday. A throwback to past travel posts. No. 1 features a road trip that I took with some friends while volunteering with Emerging Voices and IVHQ in Cartagena, Colombia. I needed a weekend out of Cartagena. I also needed a break from the confines of our volunteer house. As the minority group of the volunteer clan, an adventure was needed to explore and raucously introduce Colombia to some North American male citizens. Relax, Mom and Dad. Only the clean material makes this blog! Barry, Eliot and I left Cartagena by bus in the afternoon with a destination of Tanganga, Colombia and the close by, majestic locale of Tayrona National Park. 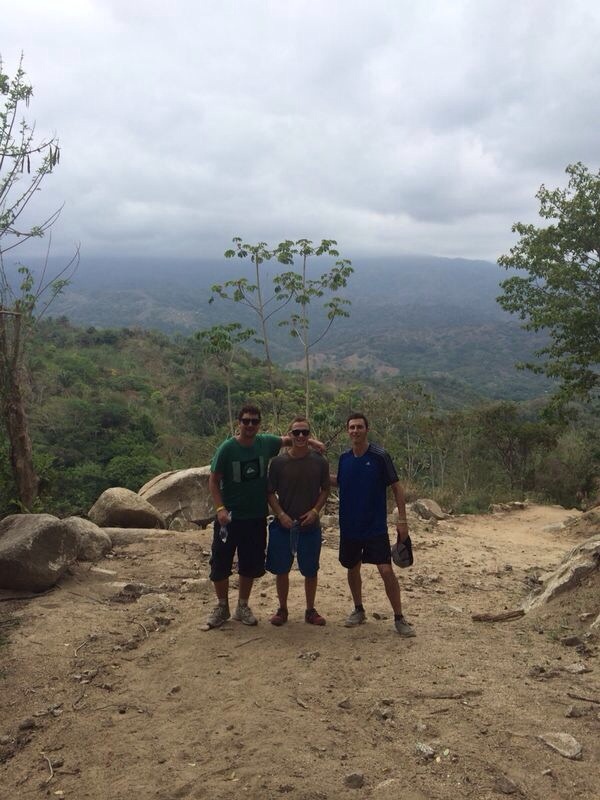 The plan was to stay in Tanganga overnight and then hike through Tayrona on Saturday morning. After a great first night, including the accommodations at the Davinga Hostel, and despite the forewarned and early construction wake up call, we happily ventured to Santa Marta to catch a bus to the park. The entrance for foreigners is about $17 USD. Once inside Tayrona, we caught a quick ride about a 1/4 of the way into the park and began our three mile trek to an unknown campsite. We experienced breathtaking vistas and aqua-hued Caribbean Sea landscapes for much of that first day – which made the trek much more enjoyable. There were various campsites and small restaurants where we were able to stop and replenish our water as the sun beat down on us at midday. After two and a half hours we finally arrived at the Cabo San Lucas campsite and backpacker haven. For $10 we each had a dirt covered hammock for the night and a fantastic place to take in a swim. The atmosphere was relaxed despite the small population of Colombians and international backpackers scattered throughout tents, hammocks, and small huts. The night was uneventful except for the wild horses and donkeys running through the aforementioned sleeping situation. Eliot, who previously coined his personal slogan “Yo soy un burro” was woken up in the middle of the night by a donkey looking for some late night loving. Eliot loves the donkeys. It’s a mutual feeling. Sunday morning was an extremely difficult day in which we knew would be long, but never envisioned the technical hike taking four hours. We decided to take a different path this time around to a different exit within the park. Instead of a calm, leisurely stroll along beaches and crystal clear water, our path consisted of 1,000 meter vertical changes and gigantic boulders that we had to scale by hardened efforts. My clothes contained as much sweat as if I had taken a dip in the ocean. My hamstrings and quads felt like they would burst. Climb after climb our trek felt like it would never end. However, after the entire morning’s hike and multiple pit stops we finally arrived at the other exit and gulped down cold bottles of water without a care in the world. Almost at the end of our 4 mile trek. Two more buses, a taxi ride, and five hours later, we maxed out our Colombian road trip experience. To celebrate our return “home” to Cartagena, we grabbed a cold Aguila beer and downed slices of local pizza while our street in Barrio Crespo, as content as the three of us on a Sunday evening, sighed a relief as the weekend was complete. Looks like I am at peace with the world after a visit to Tayrona National Park.